Electronic signatures and waivers are an indispensable part of protecting your business. Without them, your brand is vulnerable to frivolous claims, lawsuits, and a host of other legal headaches. Electronic signatures and waivers are an indispensable part of protecting your business. Without them, your brand is vulnerable to frivolous claims, lawsuits, and a host of other legal headaches. 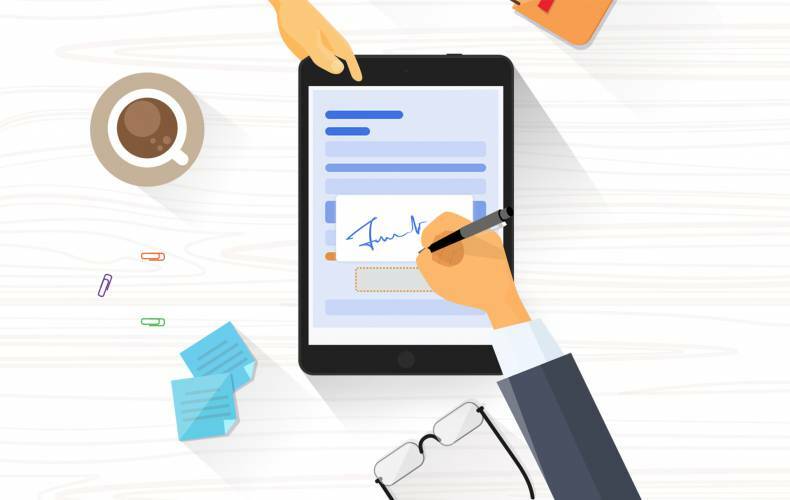 Yet, while some consider online waivers as simply a means to collect digital signatures, there’s so much more to the story. What Is an Online Waiver? Basically, the person signing the waiver is acknowledging risk may be involved with an activity but agrees to participate anyway. Providing a signature also implies that the participant won’t hold the business providing that experience legally responsible for any negative outcomes. However, what most businesses fail to realize is that – with a few simple customizations – these exact same forms can be used in a variety of other ways. From relaying basic service information, to improving marketing efforts, even authorizing participant consent. With the only limiting factor being your own creativity. While it’s natural to think a ton of work is necessary to repurpose existing forms, that’s simply not true. WaiverForever’s easy template builder makes changing your current forms (or adding new ones) a breeze. Our intuitive drag-and-drop form builder helps you design professional documents that load fast and look great on any device. With so much functionality built right in, the possibilities are endless. Event Waivers and Consent – planning an upcoming party, expo, or event? The right forms can provide legal protection against accidents, injuries, or other unforeseen circumstances. These custom waivers can also be used to acknowledge event rules, protect against acts of nature, and stipulate refund policies for situations beyond your control. A smart choice for anyone dealing with large numbers of people in an unpredictable setting. Procedure/Medical Treatment Consent – if you own a spa, salon, or studio that provides beauty or cosmetic services, you’ll want treatment consent forms available. Informed consent is required by law and says that patients must be informed about the risks, benefits, and alternatives available for suggested remedies.On the same token, these procedures may require emergency treatment should anything go wrong. You’ll need to have permission to treat in order to cover your actions (even with the best of intentions). This advice holds additional weight if you’re talking about minors or those with physical or mental disabilities. Registrations – need to automate intake at events? Conduct a membership drive? Or have participants register for tours or excursions? No problem. Create a custom form for each event and capture the exact information that you need from each person. Electronic registration makes the process fast and easy. You can include details of the event such as date/time, location, and any rules or regulations. Better yet, share an email link with your attendees and have them pre-register beforehand. This helps to reduce long lines and avoid technology issues on the day of the event. Rental Agreements – another creative option for utilizing online waivers. Rental agreements work great for adventure parks, campgrounds, or wherever space or special equipment is needed. And don’t forget about water sports, bike, or ATV rentals. Anytime there’s a risk for physical or property damage, rental agreements are a smart way to protect yourself and your investments. Talent/Model Releases – do you take photos, capture video, or use other people as part of your services or marketing? If so, you’ll want to have them sign a talent/model release form. Collecting signatures ensures you own legal rights to any media and allows you to use these files however you choose. These releases also protect you from subjects making privacy claims or objecting to their likeness being used for advertising or promotion. Parental Consent – you’ll definitely want to play it safe whenever minors are involved. Water parks and playgrounds are perfect examples. Along with daycare centers, parties, or any other type of kids activities where risk is involved. Seemingly minor incidents can quickly escalate without proper legal protection in place. Customizable electronic forms not only allow parents to authorize a child’s participation but can include consent for emergency medical treatment (should the need arise). Without this clause, providers may not be able to administer care in some situations. Service/Repair Agreements – secure online waivers are a perfect solution for service providers and repair centers as well. Technicians can use these agreements in the field to authorize service calls, obtain testing consent, and issue repair agreements. They can also see warranties and review prior service visits. All from the convenience of their company tablets or smartphones. Contracts – If you own a gym or fitness studio, you already know how important contracts are. Clients signing up for monthly services generate a reliable source of income for your business and can provide great word-of-mouth advertising. Well-designed electronic contracts clarify the terms of your agreement and can include clauses for any missed or late payments. These forms also work great for service-based businesses such as landscaping, pool cleaning, home maintenance, etc. Contracts are a necessity anytime you do recurring work for a client or customer and want to get paid. By now, you’re probably thinking about all the new ways to incorporate online waivers into your business. Yet, like others, you’re wondering how to get started or where you’ll find the time. Thankfully, WaiverForever has got you covered. Our application includes 10 pre-made forms that cover a variety of different industries. We’ve created easily-customizable online forms based on the services clients use most. Start using these forms as-is, or include additional information to make them your own. 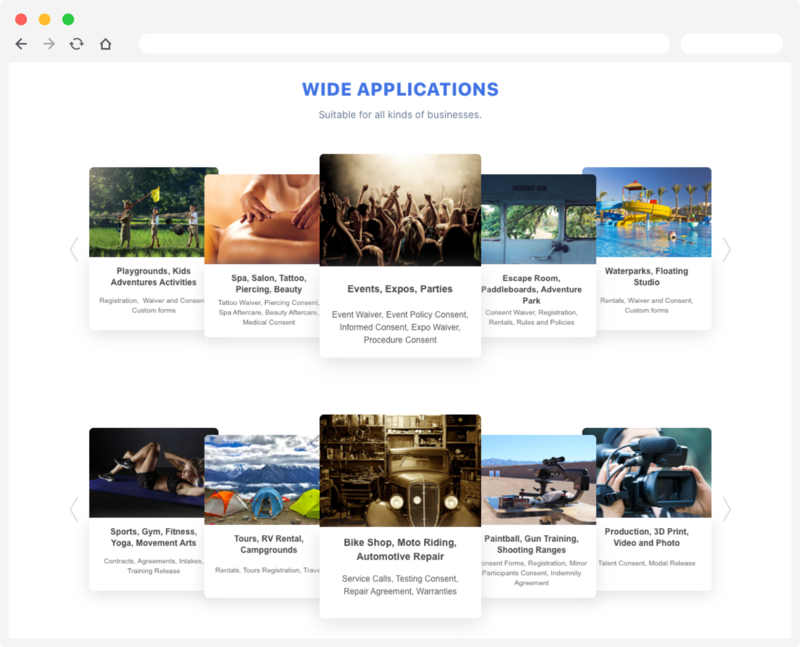 Our drag and drop interface lets you add custom images or branding and includes fields for text, checkboxes, and multiple-choice answers. Your electronic forms always look professional and are safely stored in the cloud. You eliminate the hassle of paper and can quickly find the data you need using our integrated search tool. And don’t worry if you lose your cell service or internet connection. The app continues running in the background and saves new forms to your phone or tablet. Once you’re back online, these forms are automatically uploaded to your online database. WaiverForever focuses on electronic forms, so you can focus on your business. Whether you’re a small startup, or a huge corporation, having legal protection is part of doing business these days. That means ensuring the right waivers and consent forms are available to safeguard assets, protect employees, and maintain your brand integrity. Yet, by using electronic forms, you can do so much more than just collect signatures. You can provide additional information about your services, pre-register attendees before your event, or gather prior consent to any number of procedures, activities, or outings. The choice is yours. You can utilize dozens of different systems to maintain all your legal forms, or instead house them all under one roof. Just don’t think about it for too long – your customers are waiting. Interested in learning more about WaiverForever’s powerful online forms?